In my last post, my outfit reflected the stark snowy landscape and its contrast of black and white. Yesterday, I decided to brighten things up a little for a different kind of contrast--bold color against a backdrop of white. 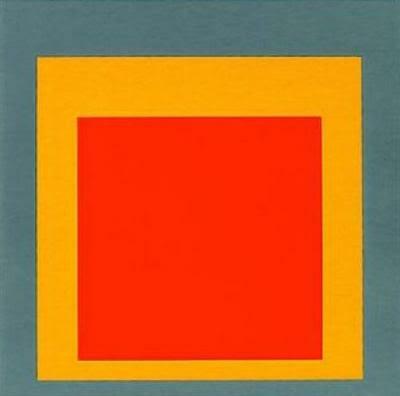 The colors in this outfit were inspired by Josef Albers' color studies. 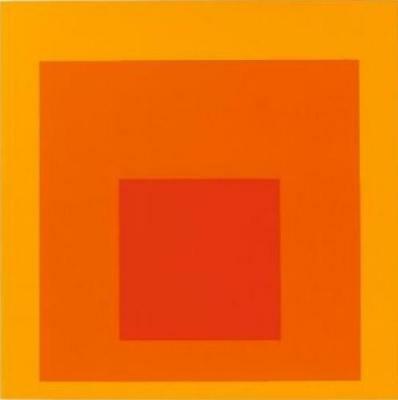 Albers (1888-1976) was a lifelong artist and teacher, whose students included Robert Rauschenberg, Cy Twombly, and Eva Hesse. 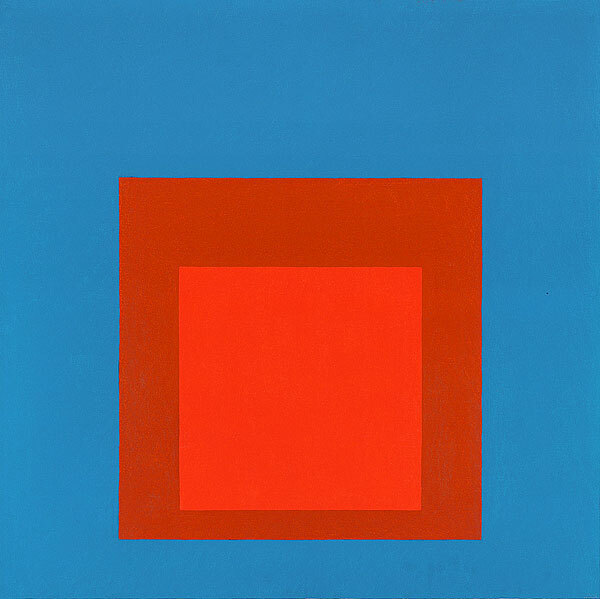 Though he was skilled in many artistic disciplines, including graphic design, printmaking, poetry, and photography, he is most known for painting, particularly his compilation of color studies entitled Homage to the Square. 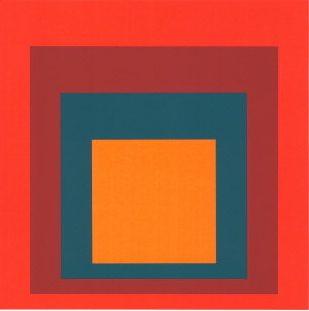 In the Homage series, Albers explored the complex relationships between colors, and eventually published Interaction of Color in 1963. The basis of his color logic was that colors are influenced by context, i.e. the same red will appear different when placed next to a different blue. 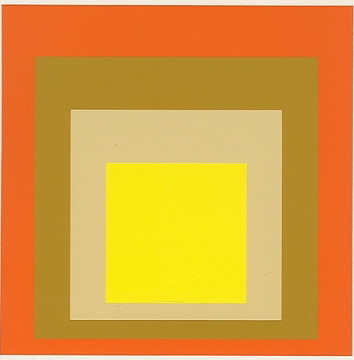 Albers' color theories are now the bases of many upper-level art classes. 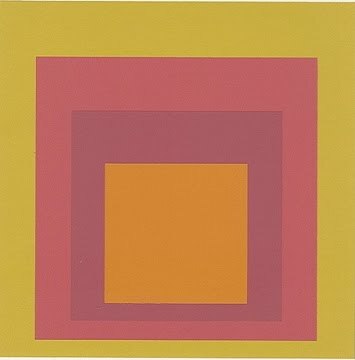 I remember slaving over my own Homage series during undergraduate painting class, and I am eternally indebted to Albers for my own deep love of color and its relationships. For this outfit, I wanted to reflect the intense hues of the Albers works and the juxtapositions of dissonant colors. I thought the motif of the scarf reflected the theme as well, and the boots were necessary to keep my feet warm! I'm wearing a sweater and skirt from J. Crew, vintage leather purse and vintage scarf, Topshop tights, and Sorel "Joan of Arctic" boots. P.S. You can now follow Artfully Awear on Tumblr for more updates and outtakes! Beautiful ensemble, Ariel, nicely accented by the your lipstick and nail color. 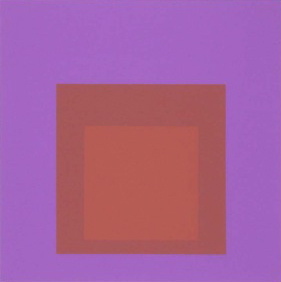 The range of Albers' color usage is impressive, he made some beautiful choices in this series, esp.the slate-like blues and violets. The scarf is wonderful too. Thank you for posting! Love the yellow and the bright red together! And I second the warm boots! I don't leave home without them! LOVING the bold colors against the bland background. Love the contrast of your top, scarf and skirt! That red skirt is GORGEOUS girl!! Now I want one! I'm doing a perfume giveaway right now if you're interested! you have a great blog by the way!Im really happy i ran into it! It's a great read. your posts and style are amazing! This is totally getting added to the inspiration file. I also love those boots and how they look with this look - so unexpected, but so perfect!! The snowy backdrop is a perfect complement to your fabulously bright ensemble! Totally diggin' those boots btw. que explosión de colores tan impactantes, me encanta!!! Great art to outfit interpretation. Not sure if I would have been able to pull of those tights but you totally do. is really is not easy to pull out a bright colored outfit in the winter ! most times we dont have the mood to wear it out ! i love how you took the artwork into the outfit ! squares + albers ok. but my sight is blurred with curves,i must say. another thing that might interest you. this year we were contacted by the albers foundation.. my grandmother mara uckunowa was the girlfriend of albers around 1919 in munich(there are sweet commenting letters from albers about her..) .. both were students and followed up to the weimar bauhaus (together we dont know). she was later assistant to muche and befriended carl auboeckII my grandfather who had followed his teacher itten from vienna to weimar. look at ittens colours they are amazing..
you might try to take also contrasting fotos of your fashion studies in closed spaces - the colours will look very different ,the contrast will be dramatic ithink. why? most of paintings were made under artificial light sources.. so the colours always look different under different circumstances. You look gorgeous! I love the mix of colours, so wonderful!! I love this colors)))That is super nice!!! Your blog is lovely!!! The vivid colorblocking going on here is magnificent! I just adore the saturated colors and the scarf that (literally) ties it all together. And those Joan of Arctic boots! I tried the hot-pink-soled version of the same boots on in the store on Tuesday! They didn't have my exact size so I had to pass them up, but I loved them dearly! You are seriously beautiful! This outfit is so fun & so super cute! I love your bold colorblocking - it speaks perfectly to the inspiration! that scarf is just amazing!! and they way you put all these colors together is just perfection. I love the colourful inspiration. The scarf and tights are perfect to brighten up winter days. hello, dear! i've listed you among my 15 choices for a Stylish Blogger Award! you may see the post on my blog if you like. this is something that reminds my own style. The Jacksonville Jaguars Nike NFL Jerseys are getting used to winning close games late in the fourth quarter. Now it's time NHL Jerseys to get used to them being part of the AFC South race. 2015 Nike NFL Green Salute To Service Limited Jerseys Jaguars defensive end Alan Branch 2015 hot jerseys sacked Marcus Mariota at the Titans' 26-yard line as time expired to key a 19-13 victory Cheap Sale Jerseys for the Jaguars over the Tennessee Titans. Jacksonville scored 2015 New Nike NFL Jerseys 10 points in the final 3:30 to push their record to 4-5. All four wins have come down to the final minute, with three of them coming down to wholesale jerseys the final NFL Max90 Shoes play.